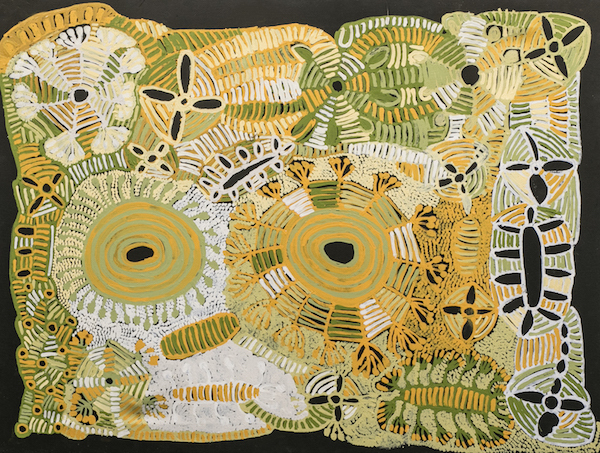 Doris Bush Nungarrayi, ‘Bush Mangarri Tjuta’, 2018. Acrylic on linen. Courtesy: the artist and Incinerator Art Space, Willoughby. Presented by Honey Ant Gallery, Stories from the Beginning is an exhibition of paintings by the Indigenous artists of Papunya Tjupi Arts. This thoughtfully curated exhibition presents new works by the talented artists of this remote art centre. Based in Papunya, the birthplace of Central Desert dot-painting, these iconic artists are passionate protectors of their culture. In sharing their ‘stories from the beginning’ they are keeping their Country and culture strong.